Three “free trade” agreements (FTAs) were due to be signed into law before the summer congressional recess; now they are scheduled to sail through Congress within the next month. All are harmful to the people who live in the countries involved—whether the United States, Colombia, Panama or South Korea. Since free trade agreements are unpopular, Washington has dropped its strategy of having a NAFTA-type agreement that ties regions together, instead pursuing trade agreements one by one. From the point of view of the U.S. worker, these trade agreements do not lead to creating and sustaining good jobs. But many people do not realize that these agreements are equally destructive for the workers and communities at the other end. The main reason unions and social movements give to oppose the Colombia free trade treaty is that it is the most dangerous country in the world to be a trade unionist. Almost 3,000 union members have been murdered since 1986, with 51 assassinated in the last year. Over the last 20 years, the Colombian labor movement has been decimated by murders, disappearances, and intimidation. In fact many of the murders were carried out by paramilitaries aided by Colombia’s intelligence agency, the Department of Administrative Security. The DAS has been implicated in deaths, providing hit lists and carrying out illegal surveillance. Clearly Colombia cannot guarantee labor rights. A second reason is that it has the greatest number of internally displaced people in the world (five million), many of them Afro-Colombian! This will only be accelerated if a free trade agreement passes with agricultural provisions that encourage further corporate exploitation of Colombian land. Although the Obama administration has signed a Labor Action Plan with Colombia that is supposed to pave the way for the passage of the FTA, it has no enforcement measures–nor does it even address the negative impact the agreement would have on small farmers, Afro-Colombians or the environment. As for the agreement with Panama, the AFL-CIO’s talking points against the treaty include that the country is a tax haven and center for narcotics trafficking. The most far-reaching of the three agreements is the US-South Korean Free Trade agreement (KORUS). If passed, this would be the largest agreement since NAFTA’s passage in 1994. 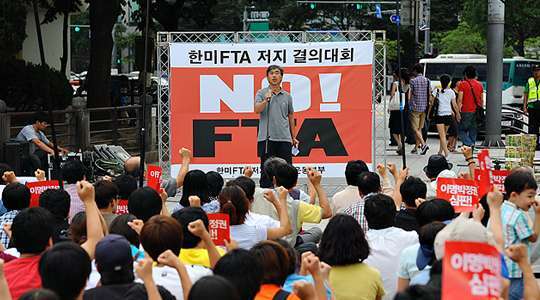 When KORUS was first negotiated in 2007 the Korean Metal Workers Union organized a five-day strike and AFL-CIO unions opposed it. President Obama renegotiated it in December 2010 and predicted it could “support at least 70,000 American jobs” and increase the export of U.S. goods by $10-11 billion. However the Economic Policy Institute predicts a job loss of 150,000 within the first seven years of passage. The U.S. International Trade Commission (USITC), an independent federal body that analyzes the effects of trade agreements for the legislative and executive branches, found that job creation would occur in some industries but there would be job loss in other sectors. The loss would be primarily in auto and electronics manufacturing, where the average hourly wage was $30.38 in 2008, and would increase in the meat production industry, where the average was $13.69. Currently Korea exports nearly half a million vehicles to the United States while receiving only 6,000. Under KORUS, in order to bump up the potential export to Korea, U.S. auto companies wouldn’t have to meet Korean safety, fuel economy or emission standards. But why would Koreans want to buy a more expensive car with lower standards? Another troubling aspect of KORUS is the 35% domestic content provision on Korean vehicles. This means that 65% of the parts can be outsourced to lower-wage countries, leading to job loss in the Korean auto parts industry. By way of contrast, Korea’s agreement with the European Union contains a 55% domestic content provision. Since Obama renegotiated KORUS, two AFL-CIO affiliated unions have decided to support the agreement: the United Food and Commercial Workers Union and the United Auto Workers. While it’s clear that the UFCW anticipates job creation in the meat packing industry, the UAW decision is more puzzling. But the evidence offered only delays the removal of a tariff. For example, the 2007 agreement would have required the United States to reduce its 25% tariff on Korean pickups immediately and end it within a decade. The renegotiated agreement maintains the tariff for eight years, then phases it out over the next two. While the AFL-CIO opposes KORUS, the defection of the two unions has decreased its effectiveness. In contrast, South Korean unions have built an impressive coalition to oppose it. The proposed KorUS FTA shrinks the policy space available to our governments to promote the public interest, and endangers our governments’ ability to protect public services and advance public health, food safety, workers’ and small farmers’ rights, and environmental preservation. We do not support a deal that only encourages growth-without-employment in both countries. The proposed agreement promotes reckless deregulation. The proposed agreement has the potential to bring about an unintended harmful effect on the relationships between the U.S. and Korea.